It took Mike Farrell 31 days to drive himself from one side of this country to the other and back. At least now he knows that it doesn't have to take a lot of gas. To promote his acclaimed memoir, Just Call Me Mike: A Journey to Actor and Activist, Farrell, probably best known in his role as B. J. Hunnicut from television's M*A*S*H, embarked on a book tour with just a single companion, a rented Prius affectionately nicknamed Mule. Navigating the never-ending book signings, radio interviews and perils of the road prompted a new book, Of Mule and Man (Akashic Books; $15.95), that has Farrell passionately speaking to some of America's thorniest issues. Interwoven with Farrell's developing affection for his Prius is a running commentary on electoral politics, social activism and American life, all amid the backdrop of the heated 2008 presidential race. Of Mule and Man lends page space to the organizations that co-sponsor his events. Among these organizations are Greenpeace, SEIU, chapters of the ACLU, and the Death Penalty Focus. Although it's hard to ignore Farrell's political slant, it is admirable that he doesn't lose sight of what's important in life: friends, family and community (and a Lakers win). What is most endearing about Farrell's adventure, though, is his humility and gratitude. His celebrity is no doubt a means to gather support for the causes he stands behind, but at every stop in every city he is stunned by the kind and inquisitive crowds from which he fields questions. Through this, his respect for community leaders, fellow activists and fans shines through the pages. Thankfully, his conversational writing style isn't weighed down by pessimistic rants. That isn't to say he's exempt from them, though. Cruising through Texas, Georgia and the Carolinas, he muses about the difficulty of hybrid technology and scoffs at the conservative-dominated airwaves of the red states. "I don't like this," Mule grunts. Welcome to America. 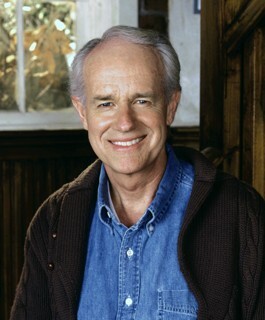 Mike Farrell reads from and discusses Of Mule and Man on Thursday, June 18, at Readers' Books. 130 E. Napa St., Sonoma. 7:30pm. Free. 707.939.1779.